While there is a lot to love about the summer months, especially in New England, one feature that is extra-appealing to me is the benefit of being able to enjoy glorious meals in the out of doors. I'm talking dining al fresco, friends, and it has been making a big impression on me lately (well, always, if we're being honest). Fairly recently, my husband, Seth, and I have been finding ourselves enjoying time in the 'burbs on the weekends (as I've mentioned before), and we are slowly being lured by the quieter surroundings and thankfully expanding, high-quality dining options. One of our favorite local restaurants, Il Casale Cucina Campana and Bar, in Lexington, has recently begun offering lunch on Sunday afternoons, and they have a truly delightful outdoor dining area. Given my above description and passion for eating outdoors in the summer, I was pretty much sold as soon as I learned of this feature. Sign me up! Il Casale has been a longtime favorite of mine and my family's due to their great menu, charming atmosphere, and wonderful staff. And ever since my dietary restrictions became prevalent (hello, Celiac! ), they have been an incredible go-to dining out option due to their expansive, Celiac-safe, gluten free menu. Seth and I decided to spend a recent Sunday afternoon on the Il Casale patio embracing summer, enjoying a cocktail, and ordering as much gluten free pasta as we could possibly consume. Which, it turns out, is a lot! Pretty much a perfect summer Sunday, in my opinion. If you didn't know, I have given in to a condition I fondly call "order everything you can because you never know when you'll come back." This is a crazy motto, especially when I know for certain that we will come back, and that my body will probably be happier if I don't order, and eat, everything available to me at any given restaurant with a gluten free menu. However, my free-wheeling self has never been able to turn down a bowl/dish/platter of something delicious, and even more so if it's an item that's not usually gluten free (and thus unavailable to me). So, Il Casale to the rescue! Enjoying a bit of a break before ordering our main course, we sipped our drinks, mused about the joyful sunshine, and the light breeze all around us. See? That summer stupor was settling in even before our lunch hit the table! Finally, we decided it was time for "round two," and determined it would be wise to order almost every GF pasta option available. Living it up, Sunday style. We selected my favorites from the menu and added in the special of the day that included truffles. Because 1. Summer and 2. Truffles. 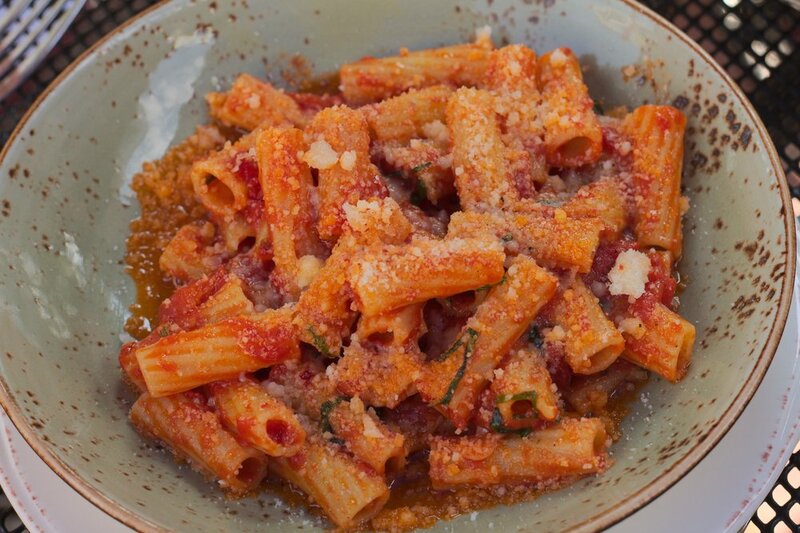 I love that Il Casale offers their GF pasta for any of their dishes - it has a "normal" flavor and consistency, and besides the fact that I no longer can remember the taste of non-GF pasta, I find it excellent! Seth and other family members who still can have wheat-based products have enjoyed the GF pasta as well, so now you know it's definitely good. In regard to main dishes: we chose the classic pasta with pomodoro sauce, risotto with shrimp, truffled pasta with Parmesan, and the chef kindly included a fourth (!!) dish that he was thinking of adding to the evening menu as a special which was a chicken cacciatore pasta. OK. This sounds like a lot of food. And it was, in fact, a lot for just the two of us. But, admittedly, we ate it all! No joke. We cleared all four plates! OMG. I don't know what came over us, but we just kept eating and enjoying every bite until each bowl was completely clean! Even our server was surprised! But actually he was impressed, so that made me feel better because I refuse to be embarrassed for finishing (and enjoying) my meal. I love (gluten free) food. Our summer stupor in full effect, we could barely imagine ordering anything else. But alas! Dessert was brought out and it was so pretty we couldn't resist - just a bite, right? Well, we shocked ourselves once again and ate both of the lovely desserts sent out by the kitchen: fresh peaches with sour cherries, honey, and crushed pistachios, and a yummy vanilla bean panna cotta with fresh basil and strawberries. Wonderful! Even after all of those appetizers, and four plates of pasta, we somehow finished both seasonally-appropriate, and scrumptious desserts. Entirely gluten free! Now, it was definitely time to be done. 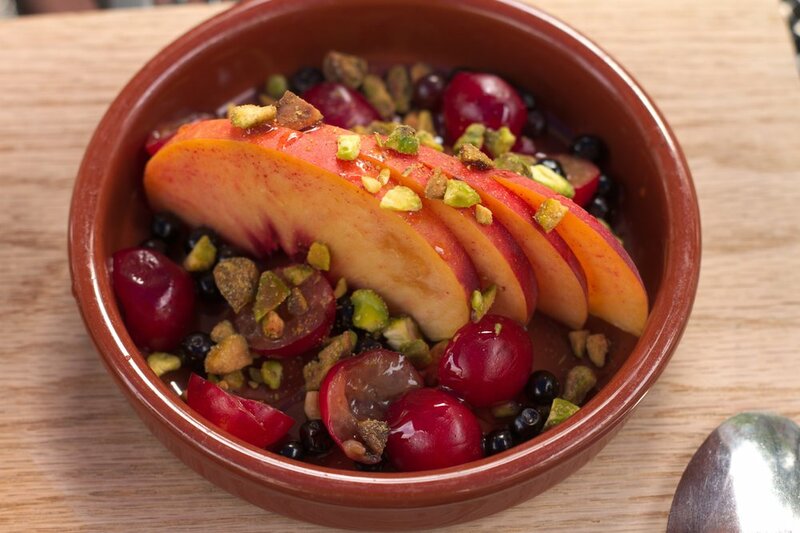 Sliced peaches with pistachios and sour cherries. Thank you Il Casale for welcoming us to enjoy your wonderful outdoor patio and delicious food, on such a lovely summer day, specifically to indulge in the gluten free options of which there are oh so many! We look forward to returning year-round because your indoor bar and dining space is a delight as well! Editor's note: Gluten Free menu is available during lunch and dinner. Please remember to inform your sever of any food allergies prior to ordering. Everyone's symptoms of Celiac Disease and gluten-sensitivity vary greatly; please make sure to order only what you're comfortable eating as this review is based solely on my personal experience.